The Inca Bridge, is a stunning example of Inca architecture, is located west of the City Inca, is a narrow path beside a granite mountain on the left and the right side is an abyss. The bridge is built on a stone base carved with two huge boulders, which include a thick trunks. If these timbers or logs will be drawn step would be inaccessible because the geography does not permit. The road before the bridge and after this has an original cobblestones. To visit this bridge, you have to walk from the guardian house 20 minutes, for different paths some very narrow, heading west, you need to register when entering and leaving. The road is very cute in the middle of vegetation and for a defined path and restored. As one advances one can enjoy the scenery of the typical flora, the sound of birds, butterflies and lush vegetation. It comes close to the bridge, obviously you can not cross, because it is very dangerous, but one can approach, enough to know, understand and take all views you want from this point, you can also see how projected path on the profile of the mountain. These log bridges were the simplest of all the bridges built by the Incas, resting on rocks, first they tended trunks horizontally, then they crossed with other sticks who were tied with ropes of straw, or leather wool, placed above branches and it was ready for use. Building bridges was very necessary, due to the geography of the place and security. 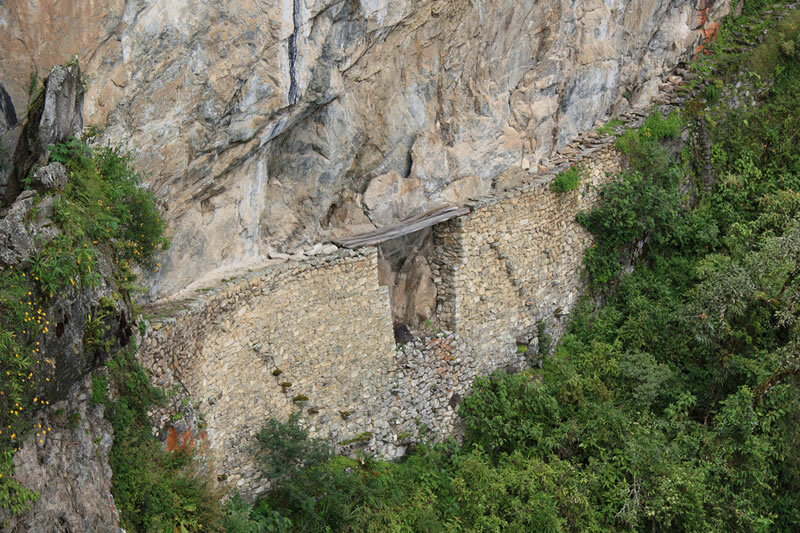 The Machu Picchu Inca Bridge was built in a strategic place, adapting to the topography.